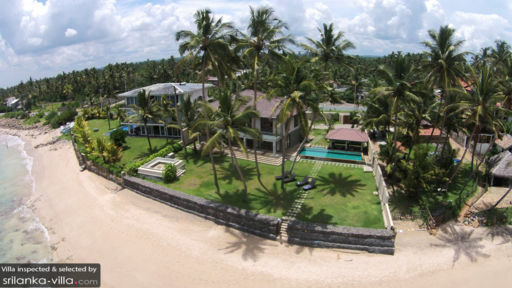 Tucked away in a village along the scenic southern coasts of Sri Lanka, Kabalana Beach Getaway is an oceanfront home offering the perfect vacation combo of sun, sand and sea. During your stay, wake up to sweeping views of the Indian Ocean, lounge outdoors in a tropical garden dotted with swaying palms, and while your hours away soaking up the golden rays of the Sri Lankan sun. Four finely-appointed bedrooms are thoughtfully designed to provide a peaceful setting for rest and relaxation. The vaulted ceilings create create a sense of space, and the wide windows invite plenty of sea breeze and light to stream in. Bed linens in eye-catching shades add a pop of colour and a touch of liveliness indoors. 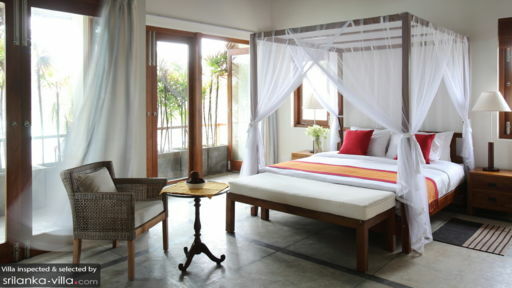 Equipped with an en suite bathroom and modern amenities, each bedroom promises a comfortable stay. Start your day on a refreshing note by taking a dip in the cool waters of the pool. If an early morning swim is not your cup of tea, head out for a leisurely stroll in the emerald garden, and let the salty sea breeze gently awaken your senses. Kabalana Beach Getaway’s lush grounds, dotted with palms swaying playfully in the breeze, offers a picturesque backdrop for alfresco meals. An outdoor lounge area, offering breathtaking views of the boundless ocean, is the perfect spot for enjoying intimate meals and a round of cocktails. The expansive glass panes of the bi-folding doors provides unobstructed views of the ocean and garden, and brings out the openness of space in the living and dining areas. A TV lounge situated on the upper floors offers a cosy environment for movie marathons and board game sessions. Minimalist interiors, featuring monochromatic hues, are enlivened with beautiful wood antiques, oriental ornaments and well-designed lighting. Culinary enthusiasts will take delight in joining the staff in exploring the bustling vegetable markets of Ahangama and renowned seafood markets of Galle. Vacation makers with a preference for relaxing in the plush comforts of the villa will not have to lift a single finger. Simply inform the staff of your dining preferences, and await a decadent dinner prepared by Indika, the in-house chef. A team of four staff members will attend to your holiday needs at Kabalana Beach Getaway. The following amenities are included with your stay: housekeeping services, personal guest services, personal chef services, security services and welcome drinks. Guests will account for the cost of groceries for all in-villa meals. Airport transfers, personal driver services, vehicle rental, boat rental, laundry services and in-villa massages are available at additional cost. 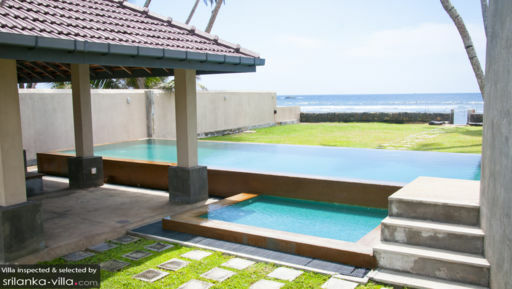 Historic Galle Fort is a thirty minutes’ drive away from the fishing village of Kabalana. This renowned attraction is home to fascinating colonial-era buildings, lighthouses and cultural sites. Do not leave without exploring its charming streets lined with alluring boutiques, art galleries and restaurants. Further south lies paradisiacal Mirissa, known for its sweeping coasts and dolphin-watching tours. Round off your holidays by making a stop by the seaside town of Unawatuna, enjoying a leisurely day lounging in beachfront cafes and dining at seafood restaurants.